Here's a review on Solstice Age Defense Sunscreen and Face Cream and Whitening Sunscreen Body Lotion. 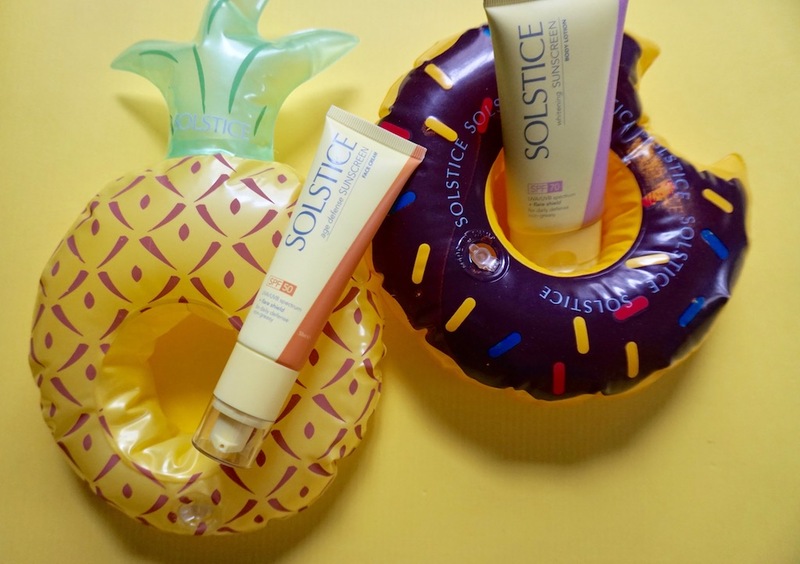 Sunscreen lovers, here's a sunscreen that gives you more than what you ask for: Solstice. This new player in the SPF category provides high SPF protection plus great skin care benefits! Tried them out a week ago and I love it! Here are more of my thoughts. 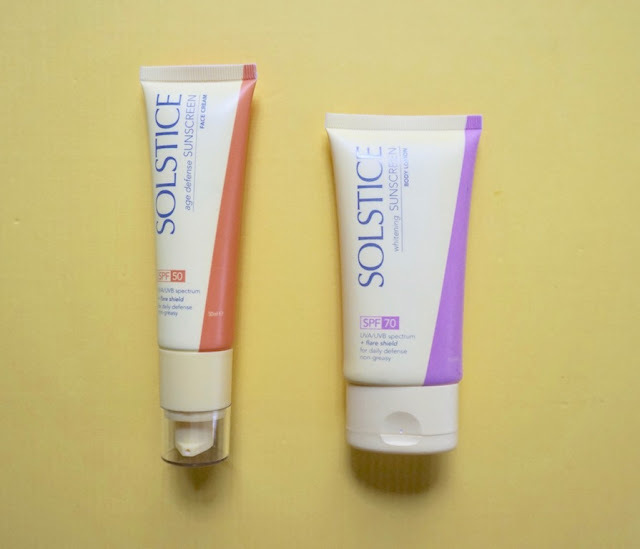 Solstice is a new brand offering two variants of sunscreen: one for the face with anti- aging benefits and one for the body with whitening benefits. The tubes come in instagrammable colors. Lovely! The body SPF seems like a rich cream, but don't let this fool you because it disappears onto the skin and leaves a light hint of moisture; it's not heavy, not thick, doesn't feel clogging, and doesn't coagulate when you sweat. 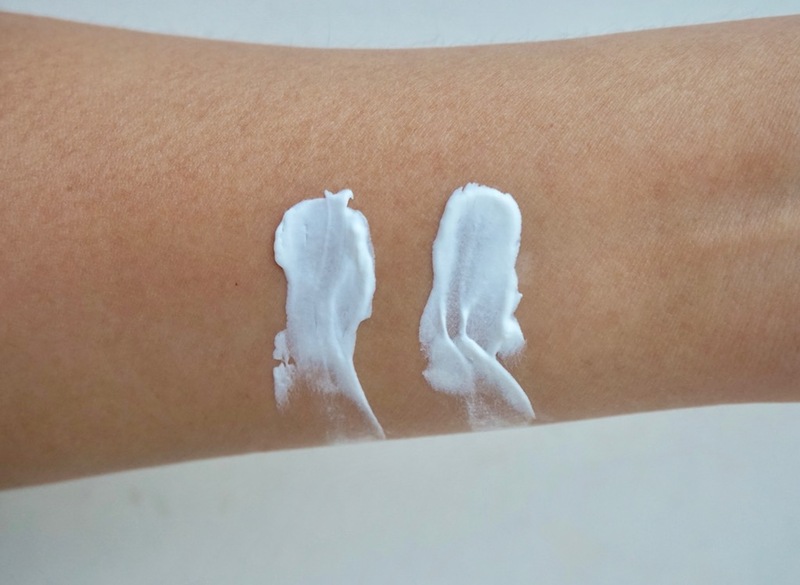 The face sunscreen may seem rich too, but it's completely lightweight and provides moisture that I don't wear moisturizer with it anymore. What I've noticed with both products is they're generally lightweight, did not break me out, and I've noticed that I burned less when I wore these and went under the sun. 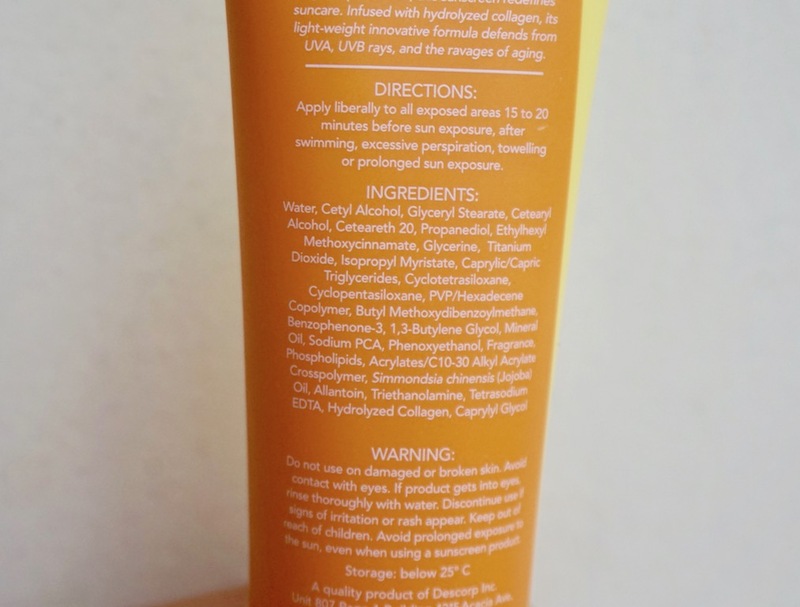 What I like about both products is they feature natural sunscreen in the form of Titanium Dioxide. 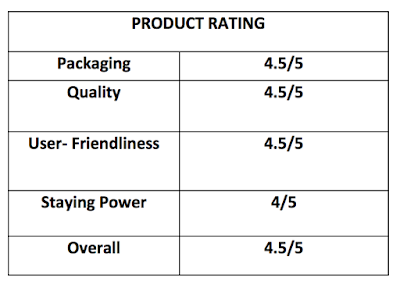 For the benefits and price, I think these products are worth the try! Please visit SOLSTICE on Facebook for more details about this brand. Sakto! Naghahanap ako ng affordable na sunscreen. :) Perfect to sa mga laging nasa arawan para iwas sunburn. Thank you so much for this Ms. Martha! 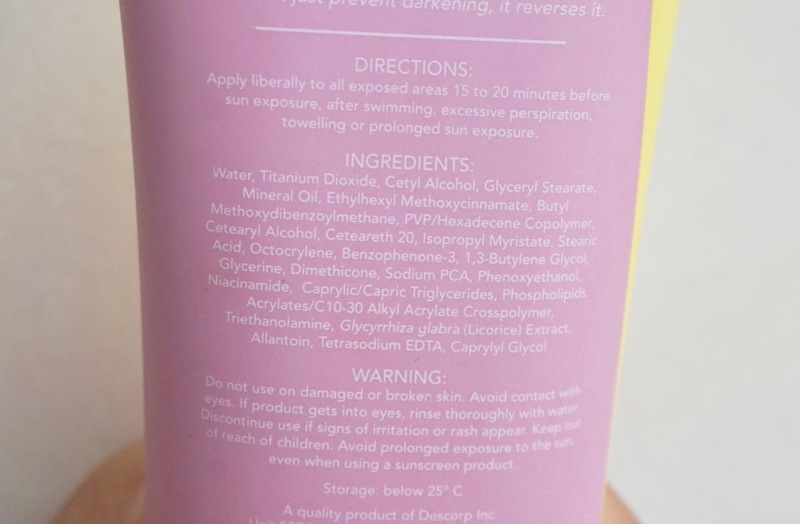 Ms. Martha, when using this type of sunscreen, pwede ba itong gawing makeup base before applying makeup? Oh I see. Thank you po! I bought the anti-aging variant and my Mom took it from me lol! I notice that it has a white cast though, who cares? At least I'm protected. I love sunscreens!! As long as d sya sticky sa skin habang nabibilad tayo sa araw, maganda yan! And long lasting pa! Nice! It's good even under makeup. hindi malagkit. When I first saw the photos I thought it was very expensive. I looked at the price and they really seem worth it. 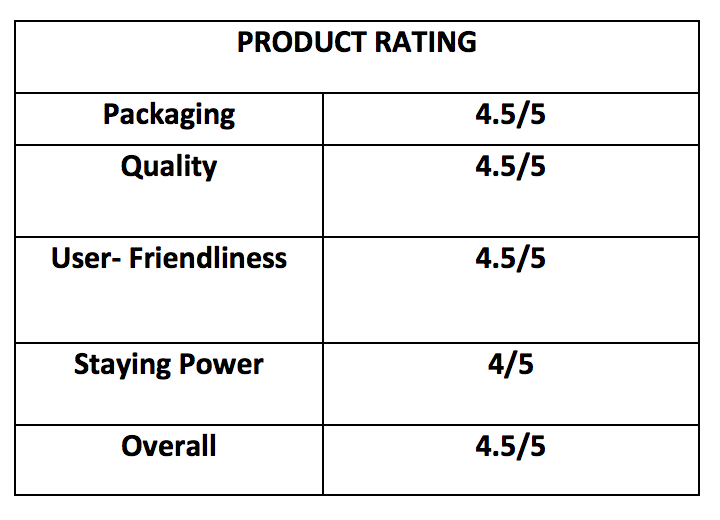 The price is pretty reasonable since the benefits and everything are all good. It's a plus that it can be worn under make-up. I've had several problems with my past sunscreens 'cause they make my make-up cakey at the end of the day. Thanks for this, Ms. Martha! Wow affordable sunscreen na hindi malagkit? I am sold! Hi! Is it okay to use the sunscreen body lotion for the face?